Week 2- here we go! Day 8: People at work have started commenting on my ‘healthy lunches’ and I told them that I’m doing the Whole30 and at least half of the people had never even heard of it! I didn’t go into super great detail (because I don’t want to be that person that won’t shut up about their new diet or eating habits… that person is the worst) but they were all supportive. Actually I don’t think they cared, but I’ll say they were supportive. Day 9: I kept hearing and reading that the first week-ish is horrible for some people. They get “carb flu,” horrible headaches, extremely cranky… I honestly didn’t feel any of that. I’m ok with that! Day 10: I started listening to the nom nom paleo podcast (they’re only a few episodes in, so you haven’t missed much) and their two little kids are adorable! I hate the term paleo (it just brings to my mind a crazy, cult-like following, just like the term crossfit does) and will refuse to use this term in the future. The end. Day 11: I have been in a pretty regular exercise routine so far and feeling pretty good with it- I’ve been doing a mix of HIIT, LISS, weights, and yoga! Go me! Day 12: Unfortunately, the foods that are good for you aren’t always the cheapest and most affordable. I’ve meticulously planned each meal for these 30 days so that I don’t waste food and therefore waste money. My first grocery trip was more expensive that I would have liked, but I guess you’ve gotta start somewhere. Day 14: Sweet potato fries are officially my favorite. Delicious. 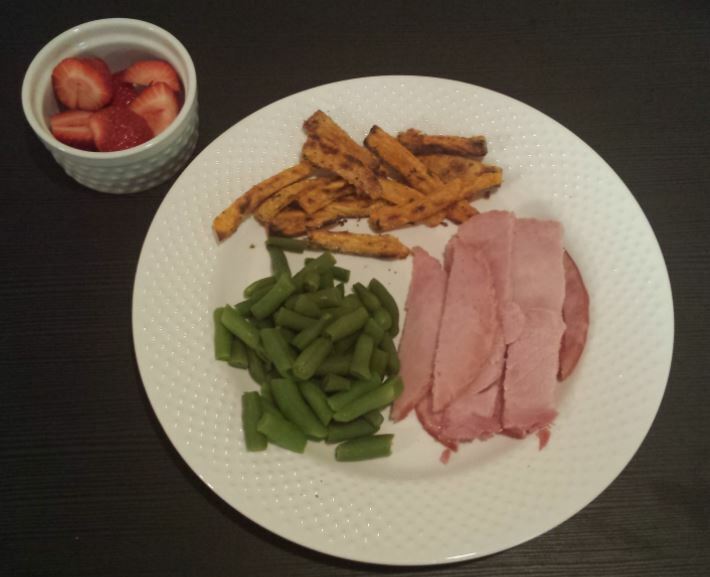 Favorite meal of the week: ham, sweet potato fries, green beans, and strawberries! Sooooo good!